The disastrous economic situation in Venezuela can’t be summed up in a single image. 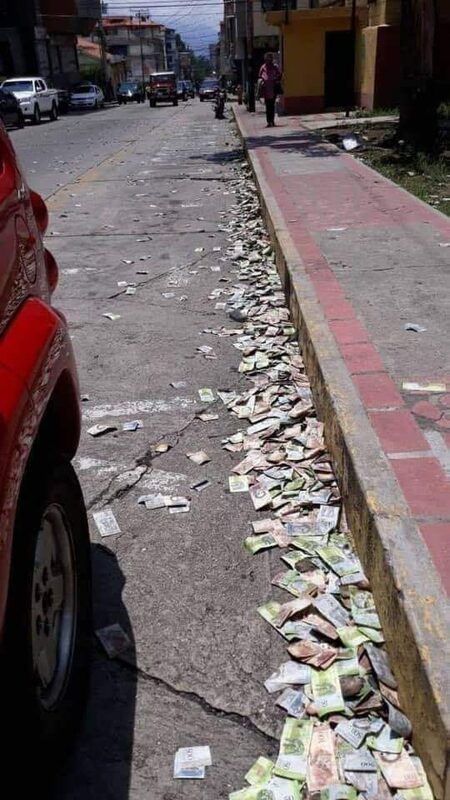 A photograph shows piles of currency throw in a gutter in Venezuela, money made worthless due to socialism. This is a genuine photograph of worthless money dumped in the gutter of a Venezuelan street. However, the accompanying caption presents an oversimplification of the series of events that led to this currency’s worthlessness and its discarding by Venezuelan residents. Hyperinflation is disorienting. Five or six years ago, 500 bolivars would’ve bought you a meal for two with wine at the best restaurant in Caracas. As late as early last year, they would’ve bought you at least a cup of coffee. At the end of 2016, they still bought you a cup of café con leche, at least. Today, they buy you essentially nothing … well, except for 132 gallons of the world’s most extravagantly subsidized gasoline. Although hyperinflation has indeed caused the bolivar to become all but worthless, the caption on this viral photograph is a bit misleading. The money shown lying in the gutter in this picture is Venezuela’s old currency, the Bolívar Fuerte, which was replaced by a new form of currency, the Bolivar Soberano, in August 2018. When the Bolivar Soberano was introduced, Bolívar Fuerte currency in amounts less than 1,000 ceased to be legal tender, and Bolivar Fuerte currency in all amounts was completely withdrawn on 5 December 2018. Hence the discarded money seen here was literally worthless not because it had no value, because it had been completely replaced by a newer currency and was no longer legal tender. Venezuela issued a new currency in an attempt to bolster its crumbling economy as the International Monetary Fund (IMF) warned that inflation could hit one million percent this year. The move, part of a dramatic raft of measures aimed at halting runaway hyperinflation, comes as thousands of Venezuelans continue to flee across the border into neighboring countries amid food and medicine shortages, political turmoil and soaring crime rates. The new “Bolivar Soberano” currency is worth 100,000 “old” Bolivares. “We found the revolutionary formula that puts work in the center of the general re-adjustment of society, based on the production of goods and the value of salary. With that, we’re gonna put to rest forever the perverse model that dollarized the prices in the country,” tweeted Venezuela’s 55-year-old leader. “I call on the people to defend — conscientiously — the adjustment of the prices on street,” Maduro later said in another tweet. A bank holiday was declared, with banks remaining closed as the new currency took effect. The rebranded currency, which has five fewer zeroes than the country’s previous currency and will be pegged to a cryptocurrency called the Petro, is intended to simplify transactions. Este lunes 11 de marzo, encapuchados saquearon la agencia del banco Bicentenario en la avenida 3, de Glorias Patrias, en el estado Mérida. El hecho fue confirmado por el diputado de la Asamblea Nacional Williams Dávila, así como por el corresponsal de El Nacional en el estado Mérida, Leonardo León. A través de la red social Twitter, informaron que los ciudadanos esparcieron montones de billetes de viejo cono monetario en las calles, los cuales después fueron incendiados. On Monday, March 11, hooded (vandals) sacked the Bicentenario bank agency on Avenue 3, Glorias Patrias, in the state of Merida. The fact was confirmed by the deputy of the National Assembly Williams Dávila, as well as by the correspondent of El Nacional in the state of Mérida, Leonardo León. Through the social network Twitter, they reported that citizens scattered piles of old money bills in the streets, which were then set on fire.